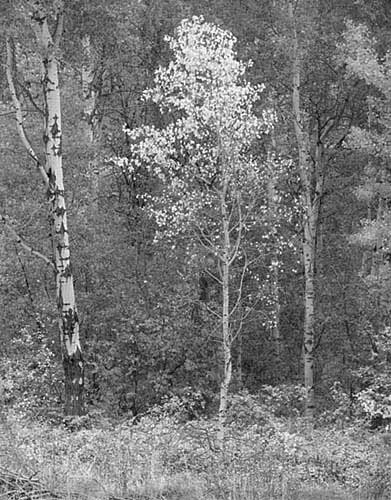 Ansel Adams did a better single aspen. But when I saw this little fellow on the back 40 at Ottis Buzzard's near Okanogan, I knew I had to get it on film. I'd often wondered about how Ansel found his single aspen? How he got such a unique angle? I think I may have gotten an insight here. I was standing above the tree on a slope. Somehow that kept a lot of light from coming through the aspen forest. Still, a lot more light shines behind the trees in my image than that of Ansel's. He also choose a much better time to photograph his tree, when there was soft, late light. I was limited to when I could gain access to where this aspen stood. So I grabbed its image in broad daylight, with only a hint of softness caused by a cloud momentarily going in front of the sun. As an aside, Ottis Buzzard passed away a few years ago. But his small home on Buzzard Lake still exists, as does a stand of aspens befitting a park. And there's a really neat sign on the road, that said "Old Man Crossing." Ottis lived into his 90s and helped homestead. He was quite popular during the depression, allowing people to grow crops on his land for food. He rode a horse in the Okanogan Day's parade in his late 80s. I first encountered Ottis while hiking his property after being given permission by a neighbor up the road. When I returned to my pickup, there he was, stomping in the dust and cussing something about my shooting at his deer. The deer liked to congregate under an abandoned apple tree, sometimes stretching their necks in an attempt for a sweet treat. I quickly learned that Ottis didn't see real clear any more, and he couldn't hear all that well, either. Some how I convinced him that my silver tripod was not a triple-barrled shot gun, and that my backpack did not contain cut up venison but only cut-film holders. I called Ottis a few times to gain permission to photograph on his property. He'd say "who?" and "what?" when I called. But eventually I'd get my request cleared, with a "sure, sure. Just stay away from my deer."